Early parish records for Bocking, Essex, contain vital statistics sufficient to construct an extensive family tree for the descendants of William Gentry of Bocking. The information for this family is remarkable in two respects: the astonishing stability of the family which for generation after generation continued to live in Bocking; and the wealth of records available in the parish registers of St. Mary's Church of the Virgin at Bocking spanning a period from 1655 to 1900. There have been many efforts to identify the source of the Nicholas and Samuel Gentry who left England and moved to Virginia in the 17th century. The results of this search have led to the conclusion that the family of a John Gentry who lived in Lindsell, Essex, until his death in 1571/2 [Old Style date] is the most likely antecedent family of Nicholas. Discussion and results of the search have been reported in two earlier publications in the Journal of Gentry Genealogy (1);. In the course of conducting this research for Nicholas' family, records of other Gentrys in Essex have been extensively combed. Among these Gentrys was the record of an extended family descending from a William Gentry lived contemporaneously with John's family but which was confined to the community of Bocking. The Gentrys of Bocking have been briefly mentioned in the early Journal articles cited above, but additional information about them has come to hand and will be presented here. Descendants of the Bocking Gentrys appear to have no direct tie to Gentrys in America and so may be of little interest to the Gentrys on our side of the Atlantic. However, they are an intriguing family in their own right, and the information printed here may be of help to Gentrys still living in the Old Country. We will consider in detail the family of William Gentry, whose wife Anna died in 1578, and who is the earliest Gentry known to have lived in Bocking. His descendants remained remarkably tied to their roots in that location from that time onward. Now a suburb of the city of Braintree, it was originally a significant village in its own right and the center of wool making in England. Except for some gaps in the first two or three generations for which we have to resort to speculative reasoning, the family is very well documented as a single, extended family. Their baptism/birth, marriage, and burial records include most, but not all of the Gentrys living in Bocking over a two hundred-plus year span. The Bocking Gentrys grew rapidly in numbers. For example, in 1785, there were nine Gentry children born in a single year to eight separate families. On the other hand, child mortality was very high. Of some 230 children born in the family listing below, 60 did not live to age ten. That is, one of every 4 children born died in infancy or childhood. This family has been partially described in previous Gentry Journal articles but will be outlined in greater detail below as a service to the Gentry genealogical community. The writer must confess that he has been carried away by the scope to which this article has developed. Originally conceived as covering only three or four generations, it has grown like topsy as each generation beckons, "just one more" but has been arbitrarily stopped at nine generations.. It now is sufficiently expansive that it ties together relationships included in wills left by four Henry Gentrys, written in 1666, 1754, 1784 and 1804, all of which have been previously published in the genealogy literature (2). The parish registers of St. Mary the Virgin Church have survived and have been transcribed and indexed for easy online retrieval. Extensive (but by no means complete) records of baptisms (or births), marriages and burials exist in these registers, beginning in 1587. We are exceptionally fortunate to have almost the entire set of registers, up to 1900, available online for searching and retrieval. This is through the agency of the British FreeReg project (3). The Bocking registers vary in condition and unfortunately, register 2 of the original records is missing. The missing register covers the period of Oliver Cromwell's Commonwealth of England, when many parish registers were lost, destroyed, or simply not maintained. This contained baptisms from 1605 to 1655, marriages from 1629 to 1655, and burials from 1640 to 1655. It is worthy of note that like other communities throughout England, Bocking suffered seriously from the plague. Parish register #3 records 441 burials due to this cause between April 1666 and May 1667 and included several Gentrys. For baptismal registers, until about 1695, either a birth or a baptism was recorded. Thereafter, both dates are listed. Another mid-stream change was made in about 1721 when the mother's name was listed as well as the name of the father. For burial records, beginning in about 1740, ages at death were included. Transcripts of registers #1, which have not been completely covered in the online database, have been provided to the author by Mr. Greg Levin, a descendant of the family and are included here in the Refence Section. Suffix numerals, when used, indicate the generation of an individual relative to William-I and are for convenience in differentiating individuals bearing the same name. All locations are for Bocking unless otherwise indicated. Identification of individuals found in the baptismal and burial registers is based upon the record of parentage or other relationship contained in the register. In the case of a few children, only a burial record has been found, but with a parent listed. This has made it necessary to interpret the known facts to make the best case for attaching the child to a family. In following births of children to families, it is obvious that not all marriages are contained within these registers. A marriage of a Bocking man to a woman in a neighboring community, for example, is not noted. Dates are given as "Old Style" double dates for the period from 1 Jan to 24 Mar each year for the years prior to 1752 to correct for the use of the Julian calendar in the registers. – married Anna [Unknown]; buried 30 Jan 1577/8. William probably died 1570 to 1590. 2 i John-II Gentry born about 1550 to 1555; buried 16 May 1603. William was a contemporary of John Gentry of Lindsell, and may have been related to him. There is no information on what his occupation might have been -- whether he worked the land like Robert of Brightlingsea and John of Lindsell, or whether he may have already started along the skilled craftsman path followed by so many of his descendants who were weavers. The only family information available for this generation are the burial records for Anna, John and Robert. Based upon the relative dates of death and their location in Bocking, we have concluded that John and Robert probably were children of William and Anna. – married Joan [Unknown]; buried 7 Oct 1602. John-II was buried 16 May 1603. All records pertaining to the birth or baptism of possible children of this John predate the earliest Bocking registers. As a consequence assigning John-III as a son of John-II rather than a son of Robert-II becomes a matter of probability rather than certainty and is based entirely on the names of the individuals and their children. – married Francis [Unknown] probably about 1580 to 1585 (buried 27 Nov 1617). Robert was buried 25 Feb 1616/7. i Francis Gentry, born probably about 1585; married John Bowtell 15 Apr 1602.
ii Faith Gentry (twin) baptized 21 Dec 1587; buried 25 Dec 1587.
iii Ann Gentry (twin) baptized 21 Dec 1587; buried 29 Dec 1587.
iv Robert-III Gentry buried 13 Apr 1599. – married (3) (speculation) Rebecca [Unknown] probably before 1620(?). – Rebecca Gentry, widow, married (2) Richard Heath, 8 Sep 1633. 6 i John-IV Gentry born about 1604.
iii Jane Gentry (twin? ), buried 29 Apr 1612.
iv Robert Gentry (twin? ), buried 3 May 1612.
v (Speculation) Rebecca Gentry born about 1618 to 1622; married Nicholas Church 1 Aug 1639 [some records have "Arthur" Church, perhaps a misreading of "Niclus" Church]. (Speculation) There is no record of John's burial but if the Rebecca who remarried in 1633 was his widow, he probably died about 1631 to 1633. 8 i (speculation) Robert-IV Gentry born about 1615 to 1620. 9 ii (speculation) Nathaniel-IV Gentry born about 1620 to 1625. This son of Robert-II is proposed as a link between the older Robert and two of his grandsons to explain a hypothetical relationship between them and the branch of the Gentry family that descended from John-II. Robert and Nathaniel were both mentioned in the 1666 will of Henry Gentry (4), and are presumed to be part of the same extended family as others in the will. Robert was referred to simply as "my kinsman" whereas other Gentrys were referred to as "cousins". This implies a slightly more distant relationship than the latter, in this case we propose second cousin. – born probably about 1604. – married (2) Francis Hagger (widow), 6 Aug 1629. John was buried 17 Dec 1675 in Bocking. 10 i John-V Gentry born about 1624 to 1626. 11 ii William-V Gentry born about 1626 to 1628. 12 iii Edmund/Edward-V Gentry born about 1630 to 1632. 13 iv Thomas-V Gentry born about 1632 to 1635. As the next of kin, John was granted administration of the will of his nephew Henry Gentry which was proved in 1666, when Henry's wife Dorothy, executrix, died prior to settlement of the estate (see below). The introduction of a second wife in the middle of a cluster of John's children poses a little bit of an identification problem. The approximate dates of birth and relationships given above are strictly guesswork. 14 i Henry-V Gentry born about 1620 to 1625. The unidentified son of John-III is hypothesized as a link tying Henry-V with the sons of John-IV as cousins. – born probably 1615 to 1620. – married (2) Grace Woolmer (widow), 13 Sep 1660. 15 i (speculation) Robert-V Gentry born about 1640 to 1642.
iii Thomas Gentry buried 26 Jul 1655. This Robert was probably the Robert Gentry who was bequeathed Henry's broad-loom in the 1666 will of Henry Gentry. He was named as "my kinsman", as opposed to the sons of John-IV Gentry who were named as cousins. He was a weaver as were most of the Bocking Gentrys. Henry's apprentice, Robert Gentry was probably the son Robert listed above. The latter was bequeathed two houses and must have been at the upper age range for apprentices, namely close to twenty-four years old (5). Judy Gentry who was also a beneficiary of Henry's will, was not identified in any manner other than by name but her bequest was the same as given to Henry's first cousins, so she must have had a relatively close kinship. – married (1?) Mary [Unknown], buried 25 Sep 1684 ("wife of Nat"). Nathaniel was buried 27 Dec 1690.
i Son born probably 1640 to 1645.
ii One or more additionsl Sons. iii (Speculation) Mary Gentry born about 1655 to 1560; married James Rayner, 16 Aug 1678.
iv (Speculation) Elizabeth Gentry born about 1663 to 1665; married Ambrose Amis, 16 Feb 1681/2. Nathaniel had at least two sons by the time that Henry Gentry (his second cousin?) wrote his will in 1666, for his "eldest son" was a beneficiary of that will. We can speculate that this son was singled out in Henry's will because he had recently reached manhood and was in his early twenties at the time, meaning Nathaniel had probably married by 1640 and thus was born in about 1620 to 1625. The two proposed daughters of Nathaniel cannot be fit easily into any of the families of the John Gentry branch of the family, but fit well here. Nathaniel was an innkeeper in Bocking. He was cited in 1680 and 1684 in Essex Quarterly Court, recognizing good behavior, but cited again in 1686 for selling beer and ale at the time of divine services. It seems fairly certain that this Nathaniel was a different individual than the Nathaniel Gentry (and his son, Nathaniel Jr.) who lived in the nearby town of Kelvedon and who was also a fourth generation Gentry (descending from John Gentry of Lindsell). (Presented in the order named in the will of Henry Gentry). John was buried 1 Jan 1780/1. i Edmund Gentry born 3 Apr 1656; buried 26 Dec 1659.
ii Dorothy Gentry baptized 1 Sep 1661; buried 4 Dec 1663.
iii Mary Gentry baptized 23 Feb 1663/4; married (?) Francis Rose, 17 Sep 1681.
iv William Gentry (twin?) buried 4 Mar 1663/4. v [Unnamed] Gentry (twin?) buried 5 Mar 1663/4. vi William Gentry (2nd) baptized 13 Jan 1666/7; buried 17 Oct 1731. William married Martha [Unknown] (buried 1 Nov 1728). vii John Gentry buried 3 Mar 1667/8. John wrote a will that was dated Nov 1680 and was proved 19 May 1681 in Bocking, leaving everything to his wife, Mary. He was a weaver and a beneficiary, along with his three brothers, of bequests from his cousin, Henry Gentry in the latter's 1666 will. John and his brother William posted bond in 1666 for his father's administration of this will. He and his father posted bond again in 1670 for the administration of Henry's widow, Dorothy Gentry's share of the estate. His marriage to Mary Hunt is missing from the Bocking records, part of the lost register #2, but is found in "Boyd's Marriage Indexes, 1625-1675". – buried 7 Jan 1677/8 ("wife of William"). – married (3) Sarah [Unknown] (named in William's will). William was buried 29 May 1683.
i Jane Gentry probably born 1656 to 1659; married John Wilson/Willson. ii Margaret Gentry buried 8 Jul 1660. William left a will that was proved 1 Jun 1683 at Chelmsford, Essex. He left a small bequest to his widow, Sarah, and most of the remainder to his daughter, Jane Willson. A bequest was left also for two grandchildren, Mary and Elizabeth Willson when each was married or age 21. No other children were mentioned. Jane was named executrix. William was a beneficiary in 1666 of a bequest from his cousin, Henry Gentry, and posted bond with his brother, John, for settlement of the will. Like his brother John, he was a weaver. – ? buried 30 May 1717 ("widow of --- Gentrey"). Edmund or Edward was buried 12 Aug 1687.
i Edmund Gentry born 14 Mar 1657/8 ("son of Edmund"); died in infancy? ii Jane Gentry born 16 Feb 1659/60 ("daughter of Edward"); married Henry Sanders, 5 Apr 1681. 16 iii Henry Gentry baptized 8 Dec 1661 ("son of Edward"); married Margaret Freeman 9 Sep 1686.
iv Edmund Gentry (2nd) baptized 20 Mar 1663/4 ("son of Edmund"); buried 5 May 1667 (died of plague?) ("--- son of Edmund"). 17 v John Gentry baptized 10 Nov 1665 ("son of Edward"); married Priscilla Owers 21 Oct 1685.
vi Sarah Gentry baptized 2 Feb 1666/7 ("daughter of Edmund"); (speculation) had a daughter presumably out of wedlock, Pleasant Gentry baptized 3 Jun 1694; buried 5 Jun 1694 ("daughter of Sara Gentry"). vii Martha Gentry buried 13 Dec 1668 ("daughter of Edmond"). viii Judy Gentry baptized 2 Feb 1671/2 ("dautr of Edward"). ix (Speculation) Ann Gentry born about 1673; married Benjamin Goodin, 21 Sep 1691.
x William Gentry baptized 29 Nov 1674 ("son of Edward"). Records in the Bocking parish register and in court records refer somewhat indiscriminately to Edmund, Edmond and Edward Gentry. We have assumed that they refer to the same person. "Edward" was named, along with his brothers, as a beneficiary in the 1666 will of his cousin Henry Gentry. A daughter, Ann, has been added to the known children of Edmund/Edward. This Ann is otherwise unidentified other than from her marriage to Benjamin Gooding, but fits into this family better than any of the other contemporary Gentry families. – buried 2 Sep 1694. Thomas was buried 27 Jul 1685. 18 i Edmund/Edward Gentry born 25 Oct 1656.
ii Ann Gentry baptized 1 Jun 1658 ("daughter of Thomas"); married Richard Bass 20 Feb 1682/3. iii Henry Gentry buried 8 Sep 1659 ("son of Thomas"). v (Speculation) Thomas Gentry buried 15 Jun 1667 (died of plague?). vi Elizabeth Gentry baptized 24 May 1666 ("daughter of Thomas"); buried 11 Nov 1667 ("daughter of Thomas"). vii Thomas Gentry (2nd) baptized 28 May 1671 ("son of Thomas"); buried 9 Dec 1674 ("Tho son of Tho"). ix William Gentry baptized 12 Jul 1674 ("son of Thomas"). Thomas was included as a beneficiary of the 1666 will of his cousin, Henry Gentry. – married Dorothy Hunt; buried 30 Aug 1666. Henry was buried 28 Aug 1666, a victim of the plague as was his wife who survived him by only two days. Henry and Dorothy apparently were childless. Henry was a woolen cloth weaver and was rather wealthy. He owned a number of houses, some of which he rented to tenants, and others were used by family relatives. Henry was cited in Essex Quarterly Court in 1661 for taking an apprentice contrary to the established requirement that an apprentice or his family had to have property totaling at least 60 shillings in annual value. Henry left a will written 8 Aug 1666, that was proved 3 Sep 1666. He named his wife as executrix. The will is rather comprehensive and makes bequests to four cousins, John ("the Younger"), William, Edward, and Thomas Gentry; a "kinsman", Robert Gentry; his brother-in-law, Roger Hunt (and two daughters); and an apprentice, Robert Gentry whose relationship is not shown. The bequest of two houses to his apprentice suggests that the latter was close to the upper age range of trade apprenticeship required by law, namely twenty-four years of age. Other Gentry relatives were a Judy Gentry and "the eldest son" of Nathaniel Gentry, both of whom were given the same bequest as his four cousins. Henry's widow did not survive to serve as executrix and in her place, John Gentry (the Elder), presumably Henry's uncle and father of the cousins named in the will, was granted administration of the will as next of kin. Roger Hunt, Henry's brother-in-law is presumed to be the brother of Henry's wife, Dorothy, rather than the husband of a sister of Henry. This is based on the lack of any mention of a sister in the will (although she may have pre-deceased Henry). Roger did not survive to claim his inheritance as the parish records list his death from the plague just thirteen days before Henry. The marriages of his daughters are in the parish records, Judith married in 1662 and Elizabeth married in 1672. This suggests a date of marriage for Roger in about 1640 to 1645, and correspondingly a date of birth of about 1615 to 1620. If we assign an approximate date of birth of 1620 to 1625 to Dorothy, we can estimate her husband, Henry's date of birth as being approximately the same. This fits with an assumption based on his relationship to his four cousins that he was similar in age to them. – born about 1640 to 1642. 19 i (speculation) Thomas Gentry born about 1668 to 1670; married Mary Underton, 22 Nov 1691. There is no record of this Robert Gentry aside from the reference to him in the 1666 will of Henry Gentry in which we speculate that, as Henry's apprentice, he was given two dwelling places being occupied at the time by apparently non-family members. We propose that he was a son of Robert-IV Gentry, named also in Henry's will, on the basis of age and his name. As an apprentice, Robert is presumed to have been under the age of 24 when apprenticeships ended in contemporary England. With the ending of the apprenticeship at Henry's death, we speculate further that he married soon after and had the child Thomas, then perhaps did not live long afterward. His line of descent, however, carried on for many years through his son Thomas. – ? buried 27 Feb 1749/50, age 80 years. Henry was buried 13 Jan 1693/4. i (Speculation) Margaret Gentry buried 28 Dec 1689.
ii Elizabeth Gentry baptized 18 Apr 1689.
iii Margret Gentry (2nd) baptized 22 May 1690; buried 19 Oct 1721; married Henry Holmes 5 Mar 1708/9. 20 iv Edmond/Edmund Gentry baptized 23 Sep 1692; married (1) Sarah Suttle 28 May 1716; married (2) Mary Rayner 7 Sep 1762. This is probably the Henry Gentry cited for assault in Essex Quarterly Court, 12 Feb 1687/8, along with John Gentry, and listed in a second citation 3 Sep 1689 for failing to pay a trade association assessment. – married (1) [Unknown] about 1680; died by 1685. – buried 10 Jan 1739.
i [Unknown] baptized 11 Jan 1680/1 (7). 21 ii (Speculation) Henry Gentry born about 1687; married Mary [Unknown]. iii John Gentry baptized 23 Aug 1688.
iv Priscilla Gentry baptized 7 Jun 1691; married Daniel White, 3 Jan 1717/8. v Jonas Gentry baptized 19 Mar 1692/3; buried 30 Jun 1694. A Henry Gentry and John Gentry were cited jointly in Essex court records in 1687, charged with assault. It was probably these two brothers who were so involved. – married (speculation) Elizabeth [Unknown] about 1686. – married (2) Samuel Janison/Jamson, 1 Sep 1698; ? buried 25 May 1727 ("wife of Samuel Johnson"). i Edward Gentry baptized 9 Apr 1687.
ii (Speculation) Elizabeth Gentry ("daughter of Elizabeth Gentry") baptized 17 Jun 1694. If the Elizabeth who was born in 1694 was a daughter of Edward, born after his death, Edward must have died in 1693 to 1694. – ? buried 16 Sep 1746, age 80 years (born about 1665). Thomas was buried 3 Feb 1732/3. i Mary Gentry baptized 14 Apr 1692; buried 17 Mar 1692/3. ii Ann Gentry baptized 5 Feb 1693/4. iii Sarah Gentry baptized 19 Apr 1696; married William Willson, 1 Mar 1719/20. 22 iv Thomas Gentry baptized 26 Jun 1697; married Elizabeth Smith, 27 Dec 1720.
v Robert Gentry baptized 16 Aug 1700; buried 30 May 1766, age 67 years. Thomas' age and the naming of a son, Robert, suggest that he was a son of Robert-V Gentry. The older Robert is believed to have had a brother named Thomas who died at an early age. Further support for this proposal is the lack of a Thomas among the grandsons of John-IV matching the vital statistics of this Thomas. – (?) buried 8 Feb 1773 "--- widow of --- Gentry, age 78" (born about 1694). Edmund was buried 15 Jan 1766, age 73 years. i Sarah Gentry born 22 Feb 1716/7; buried 13 Mar 1742/3, age 27. 23 ii Joseph Gentry born 15 Apr 1719, married Mary Gale 23 Sep 1740. 24 iv William Gentry born 16 Apr 1723; married Mary Barnard 27 Apr 1739. 25 v Henry Gentry born 3 Jul 1725; married (1) Bridget Cook 26 Feb 1745/6; married (2) Elizabeth [Unknown]. vi Margaret Gentry born 22 Oct 1727; married William Sigger 17 Sep 1745.
viii Samuel Gentry born 8 Jan 1733/4. The births of Edmund's children Sarah and Joseph were registered with only the father listed as was the practice up until 1721. Thereafter, both parents were listed so Edmund's remaining children were listed with parents "Edmund and Sarah". – buried (?) 27 Feb 1749/50, age 63, "wife of Henry Gentry" (born about 1686). i Mary Gentry born 22 Dec 1709; married Richard Ridgwell 29 Mar 1629.
ii Henry Gentry born 23 Aug 1711; buried 13 Sep 1711.
iii Henry Gentry Jr (2nd) born 26 Sep 1712; buried 25 May 1742, age 29. His father, in his will, referred to this Henry as having died earlier, leaving some property to his father and his brother John. This Henry had a son, also named Henry Gentry (40), born about 1735, who was to receive £30 when he came of age. iv Rachel Gentry baptized 12 Dec 1714; buried 31 Jul 1715. 27 v William Gentry born 27 Jul 1717; married Ann Woolmer 8 Apr 1740.
vi Susan Gentry born 8 Oct 1721; buried 17 Nov 1721.
vii John Gentry born 13 Sep 1724; married Mary Smith 7 Jun 1757; (?) Mary buried 3 Dec 1822, age 96 (born about 1726). ix Thomas Gentry born 17 Oct 1728; buried 29 Jul 1743, age 14. Henry left a will that was written 23 May 1754 and proved 14 May 1755. Henry left his estate to his sons John and William, and to his grandson Henry III, son of Henry Jr. (deceased), and conditionally to the children of William. Henry was a "victualler" (licenced tavern keeper) and appears to have been well-to-do, owning three taverns. One, named "The Saracen's Head" along with an adjoining tavern bequeathed to him by his son Henry Jr. were operated by Henry. A third, named "The Pack Horse", was operated by his son William along with Edward and Joseph Rayner and Samuel Carter. The Rayners were probably brothers of Mary Rayner who married Henry's cousin, Mark Gentry, in 1752 and/or Martha Rayner who married Mark's brother, Matthew Gentry in 1753. – married (1) Elizabeth Smith 27 Dec 1720. – buried 20 Dec 1765, age 80, "wife of Thomas" (born about 1685). Thomas was buried 13 May 1779, age 80 years. 28 i Thomas Gentry born 17 Jul 1724; married Hannah Cook 27 May 1746. 29 ii Joseph Gentry born 30 Aug 1726; married Sarah [Unknown]. 30 iii Matthew Gentry born 16 May 1728; married Martha Rayner 1 Feb 1753. There is no record of Thomas' second marriage other than in the burial record for Rebecca, nor is there any record of children resulting from that marriage. – buried 10 Sep 1783, age 61, ("wife of Joseph"). Joseph was buried 28 Oct 1796, age 79. 32 i Joseph Gentry born 3 Sep 1741; married Joanna/Joannah Rogers 30 Jan 1776.
ii Mary Gentry born 2 Apr 1745; buried 5 Dec 1820, age 77. 33 iii Timothy Gentry born 12 Oct 1747; married Sarah Cook 22 Jun 1769. 34 iv Henry Gentry born 7 Nov 1750; married Martha Hodge 3 Dec 1774.
v Alice Gentry born 14 Feb 1753; married Timothy Sach 13 Sep 1774 (witness: Mary Gentry). vi Susannah Gentry born 22 Nov 1755.
vii Ruth Gentry born 3 Nov 1758; married Joseph Bennett 6 Apr 1778. 35 viii Michael Gentry born 22 Nov 1761; married Mary Straight 17 May 1785 (witness: Timothy Gentry). ix Jane Gentry born 4 Dec 1764. Joseph's sons-in-law Timothy Sach and Joseph Bennett were witnesses to the 1784 will of Henry Gentry (below). His sons Joseph and Henry, as well as Timothy Sach, were occupants of property owned by their cousin, Henry, at the time of the will. – (?) married (2), widow, to George Elsden, widower, 21 Apr 1789. William was buried 13 Sep 1764, age 42 years. i Henry Gentry (of 1784 will) born 11 Mar 1744/5; buried 27 Aug 1784, age 40 years; will dated 8 Aug 1784.
ii William Gentry (*) born 20 Nov 1747; married Elizabeth Throughgood 4 Jun 1784. (Speculation) It was his widow who was the Elizabeth who married (2) John Mason, widower, 29 Jun 1788.
iii Mary Gentry born 16 Jan 1749/50; ? buried 1 Oct 1773, (" --- daughter of widow Gentry, age 24"). iv John Gentry born 17 Jan 1753; buried (--?) Apr 1753, "son of William". v Rachel Gentry (*) born 3 Mar 1754; married Jonas Cotes/Coats 30 Jan 1776. They had a son William Cotes (*). vi Thomas Gentry born 5 Oct 1756; died before 1784. Married 2 May 1781 Mary Taylor (*) (widow) (witness: Michael Gentry). Mary (widow), married (2) George Elsden (widower) 21 Apr 1789.
vii Susannah Gentry born 17 Jan 1759; buried 26 Aug 1761, age 2 years 6 months. viii Susan Gentry (*) born 27 Mar 1763. (*) Named in will of Henry Gentry. It is indeed fortunate that at the time William and Mary's children were born, the parish registers listed the names of both parents. He and his second cousin, also William (#27 below) who married Ann Woolmer, between them fathered nineteen children all born between 1741 and 1763, taking turns year after year. It would be impossible to sort out these children from the baptismal register without the addition of the mothers' names. William's son, Henry, left a will written 8 Aug 1784 and proved 23 Sep 1784. Henry apparently had no living wife or children of his own. He was a cordwainer (maker of luxury shoes as opposed to a cobbler who repaired them), and apparently rather well-to-do since in his will he mentions six properties that were owned by him. Named in the will were Henry's mother, Mary; a brother William; two sisters Susan Gentry and Rachel Cotes; Mary, the widow of a deceased brother Thomas; and Rachel's son, William Cotes. Two other Gentrys mentioned in the will, Joseph and Henry, were occupants of property owned by the deceased. Their relationship to Henry was not stated but they were probably Henry's first cousins, sons of his uncle Joseph Gentry. – marrried (1) Bridget Cook 26 Feb 1745/6. – (Speculation) married (2) Elizabeth [Unknown] about 1762? – buried 14 Apr 1803 ("wife of Henry Gentry" ), age 80 years (born about 1724). Henry died 5 Mar 1805 and was buried 11 Mar 1805, age 79 years. i Sarah Gentry buried 5 Jun 1758, age 7, ("daughter of Henry") (born about 1751). 36 ii Henry Gentry born 1 Dec 1753; married 31 Oct 1782 Hannah Isburne (witness: John and Timothy Gentry). iii Thomas Gentry born 23 Jul 1756.
iv John Gentry born 15 Mar 1761; buried 21 Sep 1784, age 23. 37 v Timothy Gentry born 4 Mar 1764; married (1) Ann Bennett 8 Sep 1783 (witness: John and Thomas Gentry); married (2) Ruth [Unknown]. vi (Speculation) Elizabeth Gentry born about 1766; married Abraham Paul 23 Jan 1787 (witness: Henry Gentry). The parish register for 1803 records the burial of the wife of an unidentified Henry Gentry in that year. She was probably the wife of this Henry and was likely the "Elizabeth" referenced in the record of Timothy Gentry who was born in 1764 to "Henry and Elizabeth". Henry wrote a will dated 22 Sep 1804 and proved 17 May 1805. He left a variety of buildings, land and other real estate: two weaving shops, a tenement and a parlour to his son Henry; a weaving shop to his granddaughter, Hannah; a weaving shop, tenement, and "lower room" to his grandson, John. In addition, he left various sums of money to Henry Jr.; to three of Henry Jr.'s children, Timothy, Henry III, and Hannah (when each reached age 21); to Ruth, the widow of his deceased son, Timothy, and to his grandson John, son of Timothy. John was to receive his money when age 21 or if dead, the money to go to said grandchildren Timothy, Henry and Hannah at age 21. His son, Henry and grandson John were named as executors. No surviving wife is mentioned in the will. Despite the difference in dates of wills, the Henry who wrote the 1804 will was the uncle of the Henry who died in 1784. The latter was a son of William Gentry, brother of this Henry. – buried 2 Nov 1796, age 72 ("wife of Mark") (born about 1726). Mark was buried 7 Jan 1805, age 75, widower. i Mark Gentry 11 Dec 1752; buried 24 Feb 1754, age 1 year 3 months. ii Mark Gentry (2nd) 20 Aug 1755; buried 28 Sep 1758, age 3. 38 iii Hezekiah Gentry born 22 Feb 1758; married Willoughby Hodge 7 Apr 1781 (witness: Thomas Gentry). 39 iv Joseph Gentry 19 Mar 1761; married Esther Coe 12 Feb 1782 (witness: Hezekiah Gentry). – married Ann Woolmer 8 Apr 1740; born 2 Nov 1744. William was buried 12 Apr 1778, age 62 years. 41 i William Gentry born 8 Aug 1741; married Sarah Sutton 19 Nov 1762 (witness William Gentry Sr.). ii Ann Gentry born 2 Nov 1744; married John Lorkin 28 Apr 1765.
iv Sarah Gentry born 30 Nov 1749; buried 21 Mar 1749/50 age 16 weeks. 42 v Mark Gentry (twin) born 10 Aug 1753; married Ann Osborne 28 Dec 1775 (witness: Hezekiah Gentry). 43 vii Edmond/Edmund Gentry (2nd) born 24 Apr 1755; married Ann Woolmer 18 Jul 1776.
viii Lucy Gentry (twin) born 7 Jan 1758.
ix Willoughby Gentry (daughter) (twin) born 7 Jan 1758.
x Mary Gentry born 10 Jul 1759; buried 26 Nov 1759, age 16 weeks. 44 xi Isaac Gentry born 2 Aug 1762; married Elizabeth Beerman 28 Jun 1787. William was a beneficiary and executor named in the will of his father, Henry-VII, written in 1754. This included a four dwelling complex on Church Street in Bocking. William's children then living, were to conditionally receive bequests when they became 21 years of age if their cousin Henry failed to survive to 21. – (?) buried 18 Mar 1776, age 55 years ("--- widow of --- Gentry") (born about 1721). ii Sarah Gentry born 1 Jan 1749/50; buried 30 Nov 1769, age 20 years. iii Phoebe Gentry born 9 May 1753, married Moses Sutton 22 Jul 1773 (witness: Hannah Gentry). iv Frances Gentry born 18 Jan 1756.
v Matthew Gentry born 21 Sep 1757.
vii Jane Gentry born 23 Sep 1759; married John Currey 25 Dec 1783 (witness: Michael Gentry). Thomas probably died before 1773. In that year, his widow , Hannah, rather than Thomas, witnessed the marriage of their daughter, Phoebe. The unnamed Gentry widow who died three years later was probably this same Hannah. There is a strange entry in the burial register for June 1758 for the burial of a Frances Gentry (2nd? ), age 5 months, daughter of Thomas. If correct, this would put her birth as Feb 1758, five months after the birth of her sister, Jane. If so, the only logical explanation is that she was adopted. There is no burial record for either the first Frances or her brother Matthew. They were baptized on the same day, 25 Sep 1757 which would rule out the possibility that the burial date for the second Frances was misread and should be 1756. – buried 9 Oct 1793, age 67 (born about 1726), "--- widow of --- Gentry". Joseph was buried 7 Jan 1790. 45 i Joseph Gentry born 10 Aug 1753; married Sarah Ager 30 Aug 1775 (witness: Sarah Gentry). ii Thomas Gentry born 7 May 1755; buried 26 Jun 1804, age 48.
iii Elizabeth Gentry born 4 May 1757.
iv Abraham Gentry born 6 Mar 1759; buried 19 Sep 1760.
v Ann Gentry born 9 Jan 1763.
vi Titus Gentry born 18 Jun 1764.
vii Timothy Gentry born 20 Sep 1766; buried 17 Dec 1831, age 64. – buried 6 Aug 1792, age 72 , "Martha Gentry" (born about 1720). Matthew Sr. was buried 2 Feb 1790, age 62.
i (Speculation) Matthew Gentry born about 1756; buried 29 Sep 1792, age 36.
ii (Speculation) Hannah Gentry born about 1770; married Noah Beerman 26 Dec 1794 (witness: Martha Gentry). The correspondence of name and appropriate age suggest the younger Matthew was a son of Matthew Sr. Similarly, the approximate age of Hannah and the witnessing of her marriage by Martha Gentry, suggests she also may have been a child of Matthew. – married Mary Cowland 18 Nov 1756. Jonathan was buried 18 Apr 1809, age 76.
i Jonathan Gentry born 14 Sep 1757.
ii Joseph Gentry born 17 Dec 1759; buried 22 May 1762.
iii Thomas Gentry born 18 Feb 1762; buried 17 Aug 1766.
iv James Gentry born 20 Jul 1764; married Susanna Smith 14 Nov 1786 (witness: Henry Gentry). v Mary Gentry born 11 Nov 1766; (?) married William Smith 4 Jul 1793.
vi Samuel Gentry born 8 May 1769; buried 17 Dec 1779.
vii Elizabeth Gentry born 7 Feb 1772.
viii Abraham Gentry born 6 Oct 1774.
ix Martha Gentry born 24 Sep 1776; married John Gepp 14 Dec 1795. Jonathan's wife, Mary, was still living at the time of his death. – buried 22 Mar 1790, age 42, ("wife of Joseph") (born about 1747). ii Joanna Gentry born 15 Jan 1774.
iii Jane Gentry born 5 Apr 1778; (?) married Philip Clark 8 Sep 1797.
iv Joseph Gentry (2nd) born about 1780; buried 14 Apr 1783 (age 3) ("son/Joseph"). v Ann Gentry born 5 Aug 1782.
vi (?) Ruth Gentry born 21 Oct 1785 (daughter of Joseph & "Susanna"). – buried (?) 20 Mar 1822, age 79 (born about 1742). Timothy was buried 31 Dec 1820, age 74.
i Timothy Gentry born 23 Aug 1769; buried (?) 17 Aug 1831, age 79.
ii Henry Gentry born 29 Oct 1771. Married (?) Cornelia Rayner 22 Dec 1794 (witness: Henry Gentry). Cornelia was buried 1 Mar 1818, age 44 (born about 1773). iii Sarah Gentry born 19 Mar 1774; married William Bingham 23 Mar 1794 (witness: Timothy Gentry). iv William Gentry born 1 Dec 1777; married Elizabeth [Unknown] about 1792. They had a daughter Rosetta Gentry (born 6 Nov 1794, "dau of Wm & Eliz"); buried 29 Dec 1813, age 19). v Mary Gentry born about 1780; buried 25 Oct 1783, age 3, "dau of Timothy". vi John Gentry born about 1783; buried 2 Feb 1784, age 2 months, "son of Timothy". vii Joseph Gentry (twin) born 6 Feb 1785.
viii Ruth Gentry (twin) born 6 Feb 1785. – born 7 Nov 1750. – buried 6 Apr 1820, age 68 (born about 1751). Henry was buried 14 Nov 1813, age 62.
i Martha Gentry born 13 Mar 1775; married Thomas Macartney 22 Jul 1798 (witness: Sarah Gentry). ii Sarah Gentry born 10 Aug 1777.
iii Mary Gentry born 9 Sep 1779; married William Ketley 24 Oct 1797 (witness: Martha Gentry). iv Henry Gentry born 26 Nov 1781.
v Elizabeth Gentry born 27 Apr 1785; buried (?) 16 Jun 1812, age 23.
vi Jeremiah Gentry born 7 Jul 1791. – married Mary Straight 17 May 1785 (witness: Timothy Gentry). Michael was buried 5 Dec 1824, age 62.
i Michael Gentry born 18 Jun 1786.
ii Mary Gentry born 23 Dec 1787.
iii John Gentry born 13 May 1790.
iv Jane Gentry born 10 Dec 1792.
v Susanna Gentry born 6 Apr 1795.
v Joseph Gentry born 2 Nov 1797. – married Hannah Isburne 31 Oct 1782 (witness: John and Timothy Gentry). Henry was buried 14 Jan 1833, age 79.
i Timothy Gentry born 17 Jun 1790.
ii Hannah Gentry born 4 Jul 1792.
iii Henry Gentry born 4 Oct 1795.
iv [Unknown child] born Apr 1798; buried 17 Apr 1798, age 1 week, "child of Henry". v [Unknown child] born Dec 1802; buried 1 Jan 1803, age 2 days, "child of Henry". Thomas and his three living children were all named in the 1804 will of his father, Henry Sr.
– married (1) Ann Bennett, 8 Sep 1783 (witness: John and Thomas Gentry). – married (2) Ruth [Unknown]. Timothy was buried 7 May 1795, age 31.
i John Gentry born 6 Dec 1783; buried 2 Feb 1784, age 2 months, "son of Timothy". ii John Gentry (2nd) born 27 Nov 1785. Timothy's widow, Ruth, and his son John were named in the 1804 will of his father, Henry Sr.
– buried 10 Apr 1798, age 41, ("---, wife of Hezekiah") (born about 1757). Hezekiah was buried 15 Jul 1799, age 41.
i Mary Gentry born 14 Mar 1782; buried 25 Nov 1792, age 10, "---, dau of Hezekiah". ii Sarah Gentry born 23 May 1783; married Joseph Smee, 12 Sep 1799 (witness: Elizabeth Gentry). iii Hezekiah Gentry born 10 Apr 1785.
iv Elizabeth Gentry born 13 Apr 1786.
v Jane Gentry born 16 Aug 1787.
vi Hannah Gentry born 10 Jul 1791; buried 14 Jun 1793, age 1 year 6 months, "---, dau of Hezekiah". vii William Gentry born 9 Jan 1797; buried 31 May 1797, age 1 month, "---, child of Hezekiah". – married Esther Coe 12 Feb 1782 (witness: Hezekiah Gentry). i Mark Gentry born 2 Nov 1782 (registered with father "Joseph" rather than with parents "Joseph and Esther"). ii Henry Gentry born about Apr 1784; buried 8 Jul 1784, age 3 months, "son of Joseph". iii Joseph Gentry born 2 Jun 1785; buried 1 Mar 1792, age 7, "---, son of Joseph". iv John Gentry born 16 Aug 1787.
v Ann Gentry born 18 Oct 179(0?). vi Mary Gentry born 4 May 1792; buried 24 Jun 1793, age 1, "---, child of Joseph". vii Isaac Gentry born 9 May 1794.
viii Hezekiah Gentry born 15 Apr 179(9? ), baptised 14 May 1799.
ix Mary Gentry (2nd) born 7 May 1801.
x Michael Gentry born 29 Nov 1803. Burial records are lacking for both Joseph and his wife. They may have moved from Bocking after their children were all born. – buried (?) 8 Jun 1796, age 62, (---. widow of --- Gentry) (born about 1733). i Henry Gentry born 18 Jun 1759 (to "Henry and Mary"); buried 20 Jun 1761, age 2, "son of Henry". ii (Speculation) James Gentry born about 1760; buried 14 Nov 1833, age 73. James married Susanna Smith, 14 Nov 1786 (witnessed by Henry Gentry); buried (?) 23 Jun 1798, age 42, (born about 1756). If the proposed burial date for Mary is correct, Henry must have died between 1786 and 1796. There is no record in the Bocking register for a Henry Gentry during that period of time. – buried (?) 19 Jan 1789, age 48, ("---, wife of William") (born about 1740). William was buried 13 Mar 1805, age 63.
i William Gentry born 21 Sep 1763; buried 3 Feb 1774, age 11, "---, son of William". ii Joseph Gentry born 15 Jan 1766; buried 25 Feb 1766, "son of Willm". iii Sarah Gentry born 21 Feb 1768.
iv Ann Gentryborn 2 Feb 1771.
v [Unknown] Son born about 1775; buried 19 Mar 1778, age 3, "son of William". – buried 27 Aug 1798, age 35 (born about 1762). i Mark Gentry born 28 Dec 1776.
ii Ann Gentry born 11 Dec 1778.
iii [Daughter] born Feb 1782; buried 11 May 1782, age 3 months, "dau of Mark". iv [Child] born Apr 1783; buried 18 Apr 1783, age 0 weeks, "child of Mark". v Joseph born Jul 1784; buried 1 Sep 1784, age 6 weeks, "son of Mark". vi [Child] born Jul/Aug 1789; buried 3 Feb 1790, age 6 months, "child of Mark". vii [Child] born about 1791; buried 24 Sep 1793, age 2, "child of Mark". If the Ann Gentry who married John Brown in 1795 was Mark's widow, he must have died between 1791 and 1795. – buried (?) 7 Sep 1828, age 72 (born about 1756). i Edmund Gentry born 21 Jun 1777; buried 25 May 1784, age 6, "son of Edmund". ii Joseph Gentry born 2 Feb 1779. Joseph married Mary Colly(?) 26 Dec 1797. She (?) was buried 4 Mar 1799, age 24, "wife of Joseph". They had a son, Joseph Gentry, born 27 Feb 1799.
iii Abraham Gentry born 19 Apr 1781.
iv John Gentry born 27 Apr 1785.
v Thomas Gentry born 14 May 1787.
vi [Son] born Jul 1788; buried 14 Aug 1788, age 1 month, "son of Edmund". vii Ann Gentry born 6 Jul 1789.
viii Thomas Gentry (2nd) born 2 May 1793. – buried (?) 9 Feb 1842, age 78 (born about 1763). Isaac was buried 27 Dec 1802, "age 42" (born about 1760). i Joseph Gentry born 15 Sep 1789.
ii Isaac Gentry born 11 Dec 1791. – buried 7 May 1825, age 70 (born about 1754). Joseph was buried (?) 25 Oct 1834, "age 83" (born about 1751). i William Gentry born 13 Apr 1781; buried 7 May 1782, age 1, "son of Joseph". ii Henry Gentry born 9 Aug 1783.
iii Joseph Gentry born 22 Apr 1785.
iv Jane Gentry born 16 Dec 1787.
v John Gentry born 22 Nov 1794. We have arbitrarily ended the listing here after nine generations which includes virtually all births, marriages, and burials recorded prior to and shortly after 1800. A Henry Gentry who died in Wethersfield in 1578, has no great significance or genealogical heritage. He had no descendants and is known only because he left a will which has survived to the present. We mention him here because of his name, Henry Gentry, which is found nowhere else in early Essex records other than with the Gentrys of Bocking. The repeated occurrence of the name in that family leads one to wonder if Henry of Wethersfield was not related to the Bocking Gentrys and how. 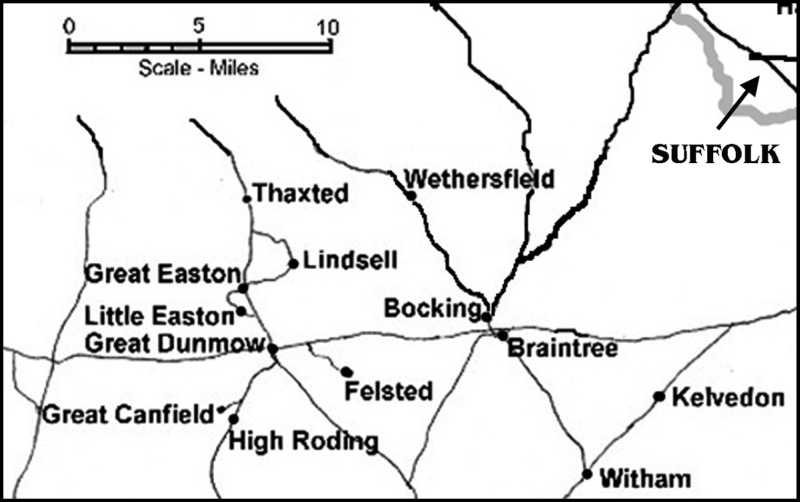 Wethersfield is roughly six miles from Bocking, located on a major traffic route out of Bocking. From his will (refr. 4 below) we can glean a few conclusions as to his personal situation. His estate consisted of cash, articles of clothing, a piece of leather (not described), a hutch (assumed to be a piece of furniture used for storage) and assorted instruments of his trade. The fact that one of his bequests was a piece of leather suggests Henry was a leatherworker -- shoes or clothes (such as the leather doublet and breeches he gave away), or both. His cash was rather evenly divided among his beneficiaries showing evidence of a desire not to omit anyone. It was not a large amount, totalling a little over three pounds sterling but rather more than one would expect to be lying around as cash. The bequests of various pieces of clothing to friends suggest that Henry had little more to his name than literally, "the clothes on his back". The will names three sisters, two of them married and one unmarried. No other relative -- wife, child, brother, parent, niece or nephew, grandchild -- are named. Two of the beneficiaries are identified as goddaughters, but otherwise the beneficiaries are identified only by name and are assumed to be friends, neighbors and fellow-tradesmen. From these meager clues, we can put together a picture of the deceased Henry. Firstly, he must have been single, or if he had once had a family, they had all died earlier. It appears that his parents had died before him and all that was left of his family was Henry and three sisters. (There is, of course, the possibility that the failure to mention any other sisters or brothers was because they did not live in Wethersfield). What can we learn from these facts about Henry's approximate age when he died? 1. There is no mention of any children of his married sisters. That may have been because they were only recently married, or any children were young enough that they would not have been considered in determining beneficiaries. Depending upon how much younger or older that Henry was compared to these sisters, it appears that he was on the younger side of adulthood rather than middle-aged. 2. Henry had two godchildren, one of whom was under the age of eighteen, but probably within a few years of that age, otherwise she would not have been considered for a bequest in the will. The second godchild may have already reached age eighteen, for there was no restriction placed upon her bequest. In order to have sponsored a godchild, Henry would have had to have been an adult at the time. This suggests an age of at least 21 plus say 15 to 18, which would be in his late thirties or early forties. We suggest an inclusive age range of perhaps 35 to 45. Putting these estimates together, an estimated date of birth for Henry may have been 1535 to 1540. Does this give any clue as to his relationship to other contemporary Gentrys. His birth date lies midway between that of the first and second generations of the Bocking Gentrys. He could hardly have been a third son of William of Bocking, for neither John-II or Robert-II were mentioned in the will. He conceivably might have been a younger brother of William, especially if William's birth were closer to 1530 than 1520. If so, we have difficulty explaining why Henry's sisters were living in Wethersfield rather than Bocking. Another possibility is that Henry could have been a son of a considerably older brother, or a son of a cousin. The latter is perhaps the most likely. If Henry and William were indeed related, we can speculate that William and Henry's father came to the Bocking-Wethersfield area some time during the early to mid-1500's. Both probably were tradesmen as opposed to being farmers like John of Lindsell. William stayed in Bocking and was survived by many Gentry descendants. Henry's father went off on his own the short distance to Wethersfield and raised a family of four children there. Because this father's son, Henry, had no children and the only other source of descendants were daughters, the Gentry name died out in Wethersfield and is remembered only because Henry wrote a will that has survived to today. 1. Summary of Parish Register #1 of St. Mary's Church, Bocking, Essex. Bocking registers are available online beginning with parish register #3 and will not be repeated here. 3 Sep 1666 Bond by John Gentry of Bocking, weaver, and Wm Gentry of same, weaver. John Gentry the elder, next of kin, appointed administrator of will of Henry Gentry; wife Dorothy, named as executrix, died before will could be proved. 22 Feb 1670 John Gentry of Bocking and John Gentry, senior, posted £200 bond to administer goods of Dorothy Gentry of Bocking, dec'd. Leaves to wife Mary; she to be executrix. - Wm forgiven rent owed. -- Son, John Gentry – messuage in Bocking called "The Saracen's Head" occupied by Henry along with adjoining messuage bequeathed to him by the will of his son, Henry. - John to pay grandson Henry Gentry III, £30 at age 21 else if dead, to children of Wm Gentry at ages 21. - £40 owed from will of Henry Jr.
*Note. A "messuage" consisted of a shop or dwelling place (in this case probably a tavern licensed by Henry) along with all out-buildings, orchards, gardens, and the immediate land on which they stood. -- Mother, Mary Gentry – messuage in Church St. with the shop; after her decease same to my nephew, Wm. Cotes. -- Brother, Wm. Gentry, Sister Rachael Cotes, Sister Susan Gentry – 5 freehold messuages in Church St., now occupied by my sister-in-law Mary Gentry, Timothy Seach, Joseph Gentry, Henry Gentry and 1 unoccupied. 22 Sep 1804 F. Will of Henry Gentry, bay-weaver, proved May 1805 to ex'ors named; testator died at Bocking 5 Mar 1805. -- Granddaughter, Hannah Gentry, daughter of Henry Gentry Jr - copyhold messuage & weaving shop in Church St. occupied by Henry Sr.
All other implements to be sold to "those of this will"
Original on file at Essex Record Office Centre, Chelmsford, Essex, Reference D/ABW 16/250. Transcribed and interpreted in modern English from the original but with no change in personal names. Witnessed by us John Wallache, Thomas Carder and John Ludham clerk. Proved at Stebbing the 16th day of May in the year of Our Lord 1578 before Master William Brigham etc. Commissary etc. Oath sworn by the executors etc. © 2013, W.M. Gentry - All rights reserved. This issue may be reproduced in whole or in part for non-commercial purposes provided that proper attribution (including authors and journal names) is included.